This February, Graduate School of Education students Ezgi Şengül and Samet Teke visited Eton College as trainee teachers to observe the education system in a UK school and learn from their experiences there. Eton College is one of the most exclusive schools not only in England but in the world. The school was founded in 1440 by Henry VI, as a charity for the education of 70 scholars. It is a private school which only accepts boys and serves pupils aged 13-18. Since the school still sticks closely to its historical roots, almost everything is based on tradition. For example, as you walk past the statue of Henry VI, it is a tradition to always make sure the statue is on your left. This is considered a tribute to Henry, as it allows you to walk past with your heart closer to him. Another tradition is the school uniform. "Boys of Eton" (this is what students are called at Eton) wear black tailcoats, white shirts and ties, waistcoats, dark pin-striped trousers and black shoes. Masters wear stickups, white bow ties and dark suits. When we were there, we had to wear black suits and white shirts as well. The departments and other facilities of the school are located in different parts of the town of Eton, in Windsor. This is not like what we are used to seeing in a Turkish school, where everything is in one place. It must sometimes confuse other visitors to Eton as well, because Charlie Jenkinson, the master who looked after us at the school, told us that his lesson had once been suddenly interrupted by a tourist who had apparently lost her way. 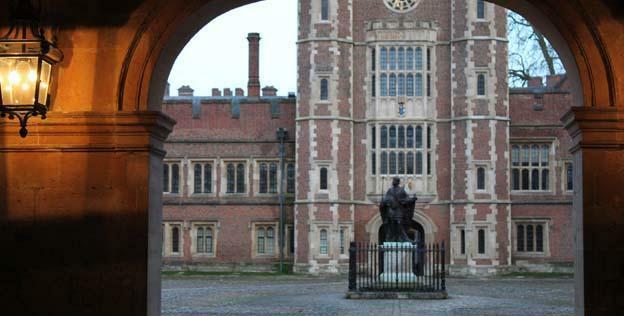 The school is famed for producing the country's prime ministers: nineteen British prime ministers, including current Prime Minister David Cameron, have received their educations at Eton. The school has also had good relations with the British royal family since a very early date. Prince William and Prince Harry are Old Etonians (graduates of the school). So you can guess the pressure we felt upon our shoulders! However, when we arrived there, it was nothing like we had been afraid it would be. All the teachers, who are called masters regardless of their gender, were very welcoming. Because of an interesting tradition observed in the central dining room, which requires you to sit next to a seat that has already been taken rather than going to an empty table, we never had lunch alone and had the opportunity to meet many different masters from various departments. During our conversations with them we also had the chance to learn how Turkey is seen abroad. As far as we were able to observe, the school places importance on the boys' personal development and welfare as well as their academic success. They are encouraged to participate in a vast number of sports and extracurricular activities. The boys are also very clever and well-behaved in class. We taught a few lessons, and, who knows, maybe one of us taught a future prime minister of the UK! Unfortunately, those two weeks, which were filled with exciting experiences, passed very quickly. We had a remarkable time there and definitely learned a lot. Now that we are back, we still frequently find ourselves talking about Eton!